We worked with the leadership and learning team to create a learning strategy which worked with the brain. One of our clients, who were in the process of making significant changes to their operating model, came to us because they saw an opportunity to overhaul their approach to learning and development. Specifically, the human resources director had an intuition that their learning methods and the strategy being used for learning and leadership development in the company was failing to maximise the investments the company were making. He was particularly interested in what neuroscience had to say about how people learn and change behaviour, and also how the company’s learning strategy could reflect this. So, as changes were happening across the whole company, he wanted to take the opportunity to review the learning strategy and the individual programmes, the consultants they used and the delivery of learning across the organisation. He was particularly interested in what neuroscience had to say about how people learn and change behaviour, and also how the company’s learning strategy could reflect this. This approach went a long way to creating insight and a profound, almost instinctive understanding of brain-savvy learning. Our starting point was to work with the Learning and Leadership team to help them understand what the neuroscientific community was saying about how people learn and change behaviour. We shared with them the model we had created on brain-savvy learning and how this could fit into an overall learning strategy. Some of the team were highly sceptical about the methodology. Their attitudes ranged from ‘this is no different to well-designed learning’ and ‘our internal clients won’t accept programmes which are different to their expectations’ to ‘this is a threat to my expertise’. Our first job was to help the team understand the neuroscience behind brain-savvy learning for themselves, and we wanted to use this first introduction to the topic as a performative example of the model we had developed. The education sessions therefore gave participants an opportunity to experience for themselves learning delivered in a brain-savvy way. For example, rather than simply answering their ‘what’s in it for me?’ questions, we helped the team to understand their motivation and which of the outcomes would be of the greatest personal benefit. And rather than lecturing them about the hard science, we provided experiential exercises and held back the science until the debrief session to explain why, from a neurological point of view, they worked the way they do. This approach went a long way to creating insight and a profound, almost instinctive understanding of brain-savvy learning. The review also provided data on the attitudes to different learning methodologies such as e-learning, social learning platforms (which had been used to support some recent programmes) and webinars, as well as role model-led and on-the-job learning. 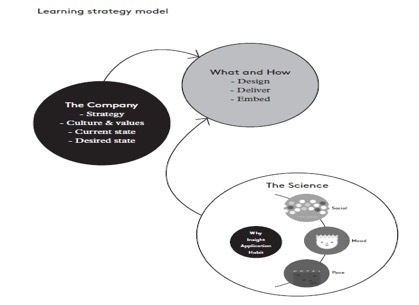 This model enables a company to both audit their overall learning strategy and to look at individual programmes. It can also guide the drafting of briefing documents for suppliers and be used to develop a checklist for reviewing responses and design storyboards. Working alongside the team, we created tools to help our client carry out all of these. The starting point was to understand the current practice and examine the link to the business strategy and what participants thought of the learning they had undertaken and how much they had applied it. We interviewed a cross section of stakeholders and programme participants in order to understand how they perceived learning, its links to strategy and the different methods that were being used, from formal programmes to on-the-job learning. This meant that, for the first time, data was available on how stakeholders and learners felt about areas like their responsibility to develop their own skills (most people had not considered this), how individual programmes supported the company strategy (few could articulate this), which programmes were beneficial to them personally and also the amount of learning participants actually applied after attending programmes (a reasonable amount of the technical stuff, it turned out, but less on the behavioural side of things). The review also provided data on the attitudes to different learning methodologies such as e-learning, social learning platforms (which had been used to support some recent programmes) and webinars, as well as role model-led and on-the-job learning. We were able to collect data on the amount of coaching received and to some extent the quality of that coaching, and also about attitudes to success using fixed mind-set versus growth mind-set questions. i) Stakeholders rarely have a good understanding of how a learning programme fits with the business strategy, even when this is something like a leadership programme explicitly designed to support the strategy. Much more explanation is generally required and the links need to be made more explicit, especially at the early stages and when people are first being invited to attend. ii) Much more explanation is typically needed in terms of people understanding the need for the programme and also what’s in it for them. Setting goals with managers before the programme or at the beginning is rarely enough; managers may not fully understand the programme themselves and are generally poor at carrying out the goal-setting discussion. A campaign of communication about a major programme made up of short, punchy learning descriptions that focus on outcomes rather than inputs. Learners being given much more responsibility for the identification of their own learning needs but in a context that requires them to make a business-centred case for attending learning or for the company providing funding. Conversation guides for managers for the goal-setting discussion and also help from HR business partners or learning consultants with the process of identifying who should attend. Where a programme is in support of the business strategy and groups of learners across sections of the company are to attend, it’s also important to supply some clear branding, a name, logo and colours, and a cascade of the programme. Starting the roll-out with the most senior people and progressing to the more junior. Another tactic that works well is attendance in work groups. iii) Learning and leadership departments don’t always dedicate sufficient time and resources to embedding learning. The focus is too much on the event-based programmes, and the split between centres of expertise that design and roll out new programmes and shared services that manage on-going programmes usually exacerbates things. Learning needs to be seen as a process rather than an isolated event, and resources need to be made available to support the programme before, during and after the formal learning. iv) There is, even now, limited use being made of technology such as webinars and social learning platforms as an integral part of the learning methodology. This is especially true for programmes involving more senior people. What’s more, the small number of virtual programmes that are being provided are typically under-supported. Webinars are more often used as short, one-off sessions rather than as a methodology to support on-going learning or to deliver programmes across geographies. They are usually stand-alone initiatives with little follow-up or embedding. However, when this technology is properly exploited, the benefits to learning are unarguable, as are the cost savings in travel and down time. v) The 70/20/10 framework has been misunderstood in many companies and is causing learning functions to overlook the need to provide role models and on-the-job coaches who understand the future needs of learners rather than what’s worked well in the past. This is a particularly important issue in sectors that are undergoing rapid change. vi) Anecdotally, individuals say they apply only around 1% of the learning they experience from programmes designed to create behavioural change. It’s higher for technical learning, but nevertheless it looks like many companies are wasting 99% of their behavioural learning budget and this includes most leadership programmes. This is mainly due to the lack of embedding after a learning event, the lack of experiential learning and the uncertainty in the minds of participants about the link between the behaviours and future success. vii) In our work with companies (and maybe we have been unlucky!) the most conservative attitude to changing the way learning and leadership programmes are designed and rolled out tends to come from the learning function itself. Whilst this is the brain’s threat response in action, it’s also a worry for the ongoing influence of the function. The outcome of the review was a clear, simple articulation of the company’s learning strategy and how it supported the business strategy. Back to our case study. The outcome of the review was a clear, simple articulation of the company’s learning strategy and how it supported the business strategy. This was a very straightforward document that could be used as a guide to the Learning and Leadership team and that would also come in handy when telling managers how learning supported the business strategy. It included a small number of core principles that would guide the positioning, development and measurement of learning both during programmes and back in the office. Efforts were made by the client to integrate the strategy and principles into all HR processes including talent, performance and promotion. This is on-going work. In addition to an overall review that spanned the breadth of the company’s learning strategy, we also took a closer look at individual programmes to ensure that our general findings and recommendations held true on both levels. We found that the programme design lacked experiential learning even when the vendor claimed to provide this (this has been typical of our findings in other companies too). Many programmes also relied heavily on role plays which are not only unpopular with participants but also, we believe, result in people undertaking practice in a disassociated state which makes it hard to apply the learning back at work. In this particular case, we found that they used negative role models, applied too much stress to participants and had limited flexibility in the intensity of the event for different learning groups, which is typically the responsibility of the facilitators. We also found there was little or no time set aside for reflection. One point of particular concern was that the learning professionals in the company had limited experience of events that matched the brain-savvy model (except what we had given them) and therefore it was hard for them to assess what was being offered. We overcame this to some extent by jointly developing checklists, asking vendors to demonstrate how they facilitated events and being clear about requirements in briefing documents for vendors. The client wanted – and we helped to design and develop – a leadership programme that demonstrated the brain-savvy learning model. The client wanted – and we helped to design and develop – a leadership programme that demonstrated the brain-savvy learning model. This had two benefits. First, it enabled the Learning and Leadership team to test the model and to measure the results in terms of actual business and behavioural change. Second, it gave the Learning and Leadership function an opportunity to work on the programme from conception all the way through to embedding. We provided coaching and acted as a ‘critical friend’ as the programme took shape, helping the team understand some of the nuances of brain-savvy learning in the context of their own company as well as appropriate learning goals and stakeholder expectations. Designing a programme and individual elements based on how the brain learns. As part of this, we made sure that participants understood what the benefits would be to them personally if they attended the programme and adopted the new behaviours. Generating insight rather than telling people how to behave. The brain is more likely to act on personal insight. Reinforcing insight by using tools that help apply learning and continue to apply it back in the workplace. Pacing learning to avoid overloading people and providing active reflection such as coaching on the go. Packaging content into digestible chunks and using multiple learning methods and media. 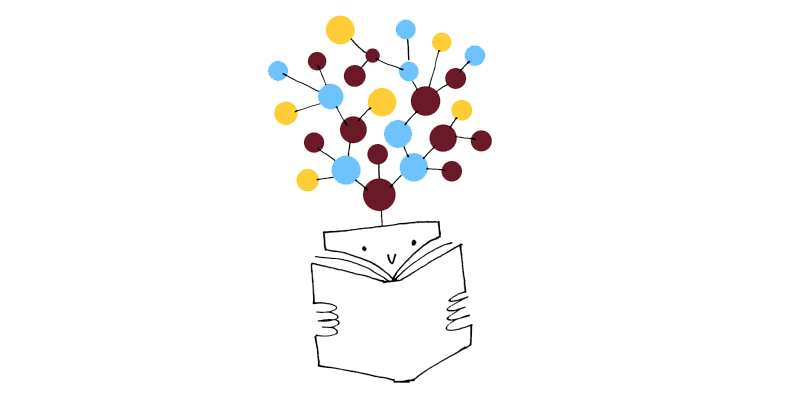 Providing short learning modules and using review techniques to reinforce learning and ensure efficient, effective spacing. Applying a scientific understanding of habit formation to create new behaviours and help them take root. This approach facilitates greater personal change and buy-in from people so it affects the bottom line too: It is, quite simply, a better return on the company’s investment. A site where participants could continue to access materials after the face-to-face programme elements were complete. This also created a community of learners who were willing and able to help each other. Group coaching sessions with participants 3, 6 and 9 months after the workshops. Shorter workshops to deepen skills in key areas throughout the year. New materials supporting the themes of the programme. These were sent out periodically to remind people of their commitments and the insight they had gained. The setting up of a buddy system. The buddy provided ongoing support and coaching. Workshop participants also committed to how they were going to apply some of their learning from the workshop in the form of a leadership charter for working with their teams. "Your expertise in neuroscience, experience as an HR leader and collaborative, authentic and generous approach are an invaluable combination. While working with you we have had fun, challenged our own mind-sets, built our capability and changed our approach to development and leading change."